The World Health Organisation predicts that depression will be the leading cause of disease burden by 2030. Today, mental health problems already exact a greater toll than tuberculosis, cancer, or heart disease. The world is standing up to take on the challenge of designing products and services that address the growing awareness of mental wellbeing. There has been an explosion of mental health and wellbeing apps launched across the globe in the past few years that are now being endorsed by health providers — both public and private. Additionally, we know there is an increase in spend, for example the UK Clinical Commissioning Groups (CCGs) are up 6.3% in the last year on tackling the mental health crisis. Snook is hooking up with Public Policy Lab to map design patterns for designing mental health services. Here’s why we are doing it and how you can help. Last year I wrote about the potential to review the landscape of research, design, and live services to identify common insights, user needs, and design principles on what exists today. Ultimately, I was seeking to find out if we could pool knowledge across organisations and find a way to document common patterns, both positive and negative, that could help people build new tools. Furthermore they can help with updating existing service infrastructure to better meet user needs in the mental health space. I was over the moon when Snook received a call from my friends at Public Policy Lab. We decided to take the plunge and run a ‘design pattern for mental health’ workshop in New York on the 25th and 26th of April. At Snook we’ve worked on mental health services like Aye Mind for young people in Glasgow, and undertaken research on mental health and employment for the Department of Health. Public Policy Lab have been working on tools for mental health, built from insights from reviewing the NYC Well Mental Health service for the Mental Health Association of NYC and the New York City Department of Health and Mental Hygiene. Both of us have found common insights and design patterns that are shared across our projects, and we have decided to work together to publish this. 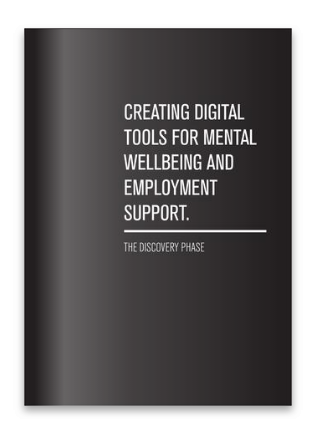 Our aim is to develop a set of patterns and principles for designing digital mental health products and services. These will support wellbeing and positive mental health. Furthermore part of our work together will be to define what the publishing framework is, and how to open this up more widely, making it as accessible as possible. What we want to ensure is that the publication of these patterns and needs are useful to anyone building a product or service. Whilst we respect there are large repositories of research in evidence of what works, we want to ensure that this brilliant knowledge is turned into artefacts. We hope that these artefacts will support people to build the right thing — across multi-channel services. We will seek to find common needs across standard journey stages. For example, a diagnosis stage may be common across multiple service experiences with standard needs around how to provide information on a diagnosed condition. As we know, identified needs across common user journey stages can be used for defining new products or services to meet unmet needs. Furthermore, they can be used for designing services to meet basic needs better. As someone who is unemployed, I need a tool to build my belief in my abilities and reflect on what I’m good at, so I can confidently undergo interview processes. We understand there are two types of patterns. There are existing observable patterns that highlight the state of things, these can be considered as anti-patterns or negative patterns. There are also positive patterns that highlight good delivery practice. Think of these as a pattern a dress maker can use to make a new thing. Therefore, we are intending to concurrently map both positive and negative patterns. Negative Patterns — what’s bad? What exists within mental health services that doesn’t work? What, if any, are common patterns that don’t promote positive wellbeing and experience across the user journey? Can we name these patterns? It is somewhat similar to Dark Patterns — observable bad practice. We can call these out. For example, ‘Repeating the past’. We have found across services users, they are continuously being asked to describe in detail the nature of a traumatic past experience, which can trigger negative responses. What do we know works out there? Is there a positive and proven way of making notifications work? On boarding users? And providing information and guidance? These could be both detailed interaction patterns and wider service patterns on the best way to process interactions over time. For example, the inverse of the above negative pattern could be, ‘explain the purpose’. By always explaining to people why you are seeking to hear their story again and acknowledging that this may not be the first time it helps them with repetition of the process. These patterns can then be turned into details, for example it could become written content on a webpage asking people to detail their previous mental health history. A vertical of delivery channels. We will predominantly focus at this stage on digital channels and ‘on screen’ however we may consider other channels including phone, paper and the edges of the user experience around face-to-face interactions. We will not directly look at face-to-face at this stage, as there is a wealth of research in to how therapies and consultation works. A horizontal of standard service stages. We will look for common stages across mental health journeys. Whilst we fully understand from our research that everyone has a different story, there are common stages with common needs we can identify. A set of themes may also emerge that provide us with further ways to identify patterns and easily communicate these. Finally we have design principles and Master Patterns. These are common principles that help design products and services end-to-end. For example, we found from our research that users were being left with nowhere to go, consistently. So we created the principle No dead ends! This directs users to access relevant support services or information. Furthermore it provides users with actions to move forward. These ideas are ubiquitous across all stages, channels, and delivery of a service. We recognise some of these may be generic and relevant to all good service delivery; defining them is important. So our goal is to simply communicate these with examples of how they may be realised and link original evidence artefacts, if possible from more than one source. You can sponsor the event. We’re looking for small contributions to help us bolster the teams we have on the day. This will help us get this information packaged and shipped onto the internet. You can contribute your patterns of insight, delivery, or master patterns and evidence. Using this form, you can submit as much content or high level thoughts as you like. If you’ve delivered a mental health service, what do you know works? If you were an agency who undertook research into this field — what did you find out? We’re looking for original reports and a summary of your findings as patterns or principles. You can come to the event. It’s in NYC on the 25th and 26th April. Touch base with the subject line ‘NYC Policy Lab x Snook’ and we’ll provide more details. Ultimately, we can’t tackle all of this in two days, but we’re intending to make a start and publish a first version of patterns which we can develop over time. Imagine, if you will, a public catalogue of positive patterns for designing mental health services. This isn’t just for people building services to fast-track ‘good services’. We believe this gives people the foundation to know what ‘good’ could look like and the agency can ensure services for mental health and wellbeing around them are well designed. Get in touch on sarah@wearesnook.com with the subject line NYC Policy Lab x Snook.